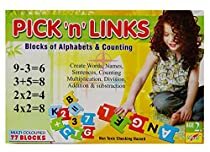 * IDEAL TOYS Pick & Links Block of Alphabets & Counting For Children Above 2 Yrs. * Material: Plastic. * Color: Multicolor. | Size: 13.5 x 9 Inches (Approx). * Weight: 510 Grams (Approx). * Age Group: 2 Years and Above. * Brand: IDEAL TOYS . * Sale For: 1 Pack (Multicolor 77 Blocks). * Warning: Non Toxic Choking Hazard- Small Parts, Not For Children Under 3 Years.PS: The Product You Might Receive Can Vary in Color. Product may appear slightly darker or lighter than the image due to screen settings and resolution.